Pradeep Kalipurayath | MADRAS INK. ‘Good Night Good Morning’ is a black and white, split-screen, conversation film about two strangers sharing an all-night phone call on New Year's night. Writer-Director Sudhish Kamath attempts to discover good old-fashioned romance in a technology-driven mobile world as the boy Turiya, driving from New York to Philadelphia with buddies, calls the enigmatic girl staying alone in her hotel room, after a brief encounter at the bar earlier in the night. The boy has his baggage of an eight-year-old failed relationship and the girl has her own demons to fight. Scarred by unpleasant memories, she prefers to travel on New Year's Eve. Anonymity could be comforting and such a situation could lead to an almost romance as two strangers go through the eight stages of a relationship – The Icebreaker, The Honeymoon, The Reality Check, The Break-up, The Patch-up, The Confiding, The Great Friendship, The Killing Confusion - all over one phone conversation. As they get closer to each other over the phone, they find themselves miles apart geographically when the film ends and it is time for her to board her flight. Will they just let it be a night they would cherish for the rest of their lives or do they want more? Good Night | Good Morning, starring Manu Narayan (Bombay Dreams, The Love Guru, Quarter Life Crisis) and Seema Rahmani (Loins of Punjab, Sins and Missed Call) also features New York based theatre actor Vasanth Santosham (Bhopal: A Prayer for Rain), screenwriter and film critic Raja Sen and adman Abhishek D Shah. Shot in black and white as a tribute to the era of talkies of the fifties, the film set to a jazzy score by musicians from UK (Jazz composer Ray Guntrip and singer Tina May collaborated for the song ‘Out of the Blue), the US (Manu Narayan and his creative partner Radovan scored two songs for the film – All That’s Beautiful Must Die and Fire while Gregory Generet provided his versions of two popular jazz standards – Once You’ve Been In Love and Moon Dance) and India (Sudeep and Jerry came up with a new live version of Strangers in the Night) was met with rave reviews from leading film critics. The film was released under the PVR Director’s Rare banner on January 20, 2012. Protected: AndhaDhun: What did that end mean? Those who have been trying to watch the movie from India and been unable to because of slow streaming, I think I fixed the problem by also hosting the files on blip.tv. So just head here for everything you wanted to/ never wanted to know about That Four Letter Word and also watch the film. Since it’s the world’s first film to be given away free online, I think it’s time it had a home of its own. 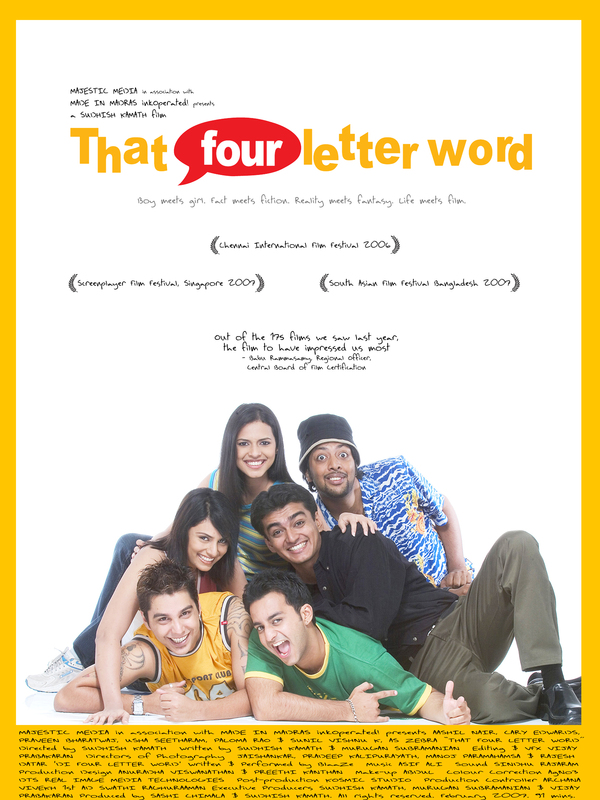 I have subjected some of you to my film already but this is for all those of you who got away without watching my first feature film That Four Letter Word which released a couple of years ago. After a couple of weeks of testing, I have finally hosted my film on my blog and I think the picture quality too isn’t too bad considering the whole film can be watched online. So whenever you have a couple of hours to spare, go here. Please note that the password is subject to change. So, if you are unable to load the page using this password, please mail me at madeinmadras at gmail dot com and I will send you the new password in case of change. 1. This is a beta version of the digital print. Given limitations of streaming video online, this is the best size we could manage for a wordpress blog. Please watch with headphones for better audio quality. If you are not happy with this picture quality, the film will be able on home video in India (through Moser Baer) and through video on demand (through Tata Sky) from mid-February 2009. Thank you again for your interest. 3. Play and Pause immediately to let the page load (Just like how you watch videos on Youtube). Depending on your internet connection, it may take around 10-40 minutes for you to load each of the two parts and you can start watching even if has buffering suggests only half of it is over because by the time you get to the halfway mark, the rest of it would have loaded too. So I suggest you let Part 2 load as you are watching Part 1. Part 3 is just the end credits, goofs and outtakes – and it’s three minutes long only because we have a long list of people to thank. So if you want to make a hit-list of all people responsible for this misadventure, don’t miss Part 3. Do feel free to report any errors or problems faced in loading the page and I will do my best to assist you. And those of you who have blogs, please feel free to spread the word and inflict it on the world. And please tell your friends not to embed the videos on to their blogs because as producers, we could flag the sites and report copyright violation. A link to this, however, will be appreciated.